Previously, every hostess knew how toStarch linen. Modern women perform this operation in the rarest of cases - if a daughter at a masquerade needs to make a magnificent suit or to defreeff at a solemn event in a gorgeous dress. Even the collars of shirts rarely starch, but in vain. Processing with starch can breathe a second life into the thing. Why do we need to starch things? The starch blend forms a very thin film on the fabric, which protects it from contamination. When washing, the film dissolves, and the dirt can easily be washed without penetrating deeply into the fibers. If the underwear and bed linens are not recommendedStarch medics - it loses hygroscopicity - then the rest of the use of starch helps to improve the appearance: keep the shape, become more voluminous. It is used to handle things more often potato starch, but you can also use rice or corn analogue. Before starching the fabric, determine the degree of concentration of the starch mixture. It depends on which product will then be processed. So, for things from light fabrics apply softMethod. It is used if you need to starch baby clothes or things from light fabrics: skirts and dresses from chiffon, gauze and batiste. The proportions of the solution: in 1 liter of water dilute a teaspoon of starch powder. To process bed linen, a liter of water is diluted with a tablespoon of starch. It turns out the treatment of medium hardness. To get a strict degree of starch, you need to dilute in a liter 2-3 tablespoons of powdered starch. This solution is processed lush povyubniki, cuffs and collars of shirts. Before you plan to starch the laundry, prepare the solution. First, starch is poured into the container, poured with a small amount of water, mixed until complete homogeneity - so that there are no lumps. Then slowly add the boiling water, and again stir constantly. If the mixture turned muddy, it will need to be put on for a few minutes to boil. How to starch a dress made of cotton or linen fabric? If you treat the starched mixture with the entire dress, the thing will sit "artificially". Currently, a special starch spray is sold in the department stores. It is applied to the details of the dress, which need starch, and then iron the material with an iron. 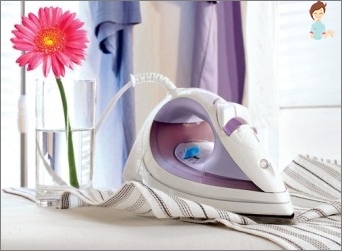 If there is no spray, you can apply a mixture of medium hardness with your own hand and also iron it. The entire product is soaked in the mixture is irrational. How to starch a skirt or blouse from cambric,Thin linen or chiffon? In a starchy mixture of the lightest dilution, the entire clothing is dropped, then squeezed and dried in such a way that no wrinkles or creases remain. Very good, if you can use the dummy. After several hours, the product is ironed, heated to an average temperature. How to starch a shirt of mixed fabric? First you need to spread it, even if the thing is completely new. When the thing is worn and there are spots, they can be removed by stain remover or peroxide. Peroxide is used only for white things. Then make a starch mixture of medium hardness - preferably dilute rice starch. The shirt is lowered into the solution, waiting for it to become soaked, then wrapped in a white cloth, squeezed, and ironed. 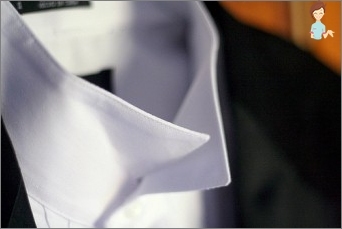 The collar and cuffs of the shirt are treated in a special way. The appearance of the starched collar makes one think that the thing is completely new. 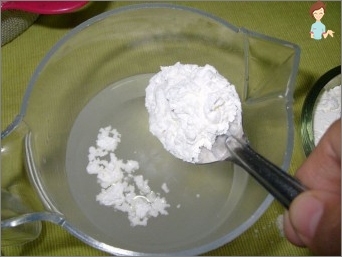 A mixture for hard starching - like herAs described above, is activated by adding boron sodium salt dissolved in boiling water. Proportions of the dilution: a tablespoon per cup of boiling water. After the solutions are combined and mixed, everything should be infused for at least 2 hours. The cuffs and collar of the shirt are gently lowered into the solution, wait until they are impregnated, then on a hard surface, remove excess liquid and lightly leave to dry.In the same way solve the problem of how to starch the stalk. A light skirt that will then cover the rigidly starched bottom will seem like a tutu of a ballerina. How to starch a gorgeous dress, baby orAdult? If you do not starch all the clothes, but only the skirt or flounces on it, the thing will look more impressive. A starch mixture of medium hardness is made, but the water will need to be added a little less. If the dress material is colored or patterned, the solution should have a temperature not higher than room temperature - otherwise the product fades. After the excess starch drains, the skirt and flounces are stripped off with an iron. A knitted dress does not hang to remove excess fluid. It is laid out on a horizontal surface on a layer of hygroscopic fabric, for example, on a terry towel. At present, there is no need to think howStarch clothes, how to make starch solution. In shops there are special sprays in aerosol packaging. Spray the product - and it looks like a new one. But if you want to give things a special chic, then you can not just starch it, but also give shine. To do this, make up a mixture of the required rigidity,Adding white talc and borax to it. The proportions are as follows: 1 part of borax - 3 talc - 5 starches. In a solution, a cloth from a thin natural cloth is soaked, and through it the article is ironed. Instead of a tissue napkin, you can use gauze. Repeat the procedure will be needed only after a few washings - the shine lasts for a long time. To after the starching things it was easier to iron, in the starch solution add the usual milk - 2 teaspoons per 1 liter of water. A drop of blue, added to the starch, will cause the underwear to shine with white. When the product is embroidered with lace or trimmed past, it is desirable to dry it, spreading it on a horizontal surface. Lace pins with needles, creating the desired shape. Starching of things gives them a special chic. After it, the fabric looks more vivid, and their hostess or master is smart.